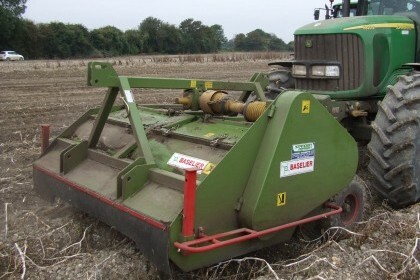 The Standen FM-2 PotatoTopper is a powerful and efficient topper featuring a cross conveyor with side discharge which effectively clears weeds and tops. The FM-2 Topper features a dynamically balanced flail rotor shaft for smooth running and 74 flail blades which create a powerful up draught for maximum suction. The Standen FM2 Potato Topper is equipped for front or rear tractor mounting with adjustable clockwise / anti clockwise P.T.O inputs and features heavy duty height control wheels with easy adjustment. With a strong belt drive, choice of pulleys and speeds and new 'assistor' flights to clear hanging debris for the cross conveyor, the FM 2 Topper delivers effective and reliable topping.